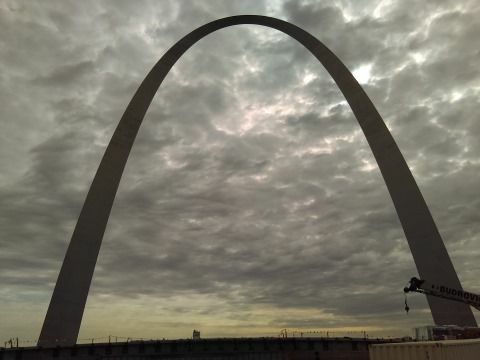 Last month I spent a little time in St. Louis. While there I got to sample some fine food, see the tourist sights, and drink some of the Gateway City's beers. 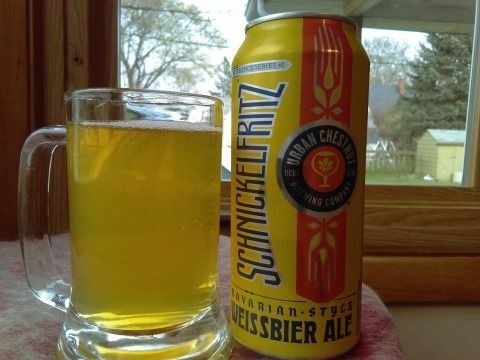 Amongst the brewies I visited was Urban Chestnut and I brought home a 4-pack of their weissbier, Schnickelfritz. According to Wikipedia the name "is a Pennsylvania Dutch term of affection usually for young mischievous or talkative children". It is part of the brewery's Reverence series which consists of traditional style beers. Urban Chestnut, founded in 2011, was one of the larger establishments I visited in St. Louis though not as old nor as large as Schlafly. Brewmaster Florian Kuplent cut his brewing teeth in Germany and so Urban Chestnut unsurprisingly offers plenty of German biers. But they also have a variety of other and newer styles on their roster. The Midtown Brewery & Biergarten was a nice spot to take in a brew on a sunny almost spring day. In addition to the beer, the cans showed some reverence to old packaging styles with their pull tabs. My mind was immediately cast back to my youth and the pull tab chains in the workshops and garages of family and friends' fathers. (As well as the cans of Old Style my friends and I stole from our dads.) 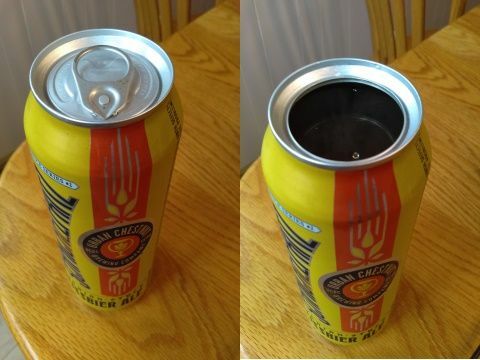 These were neo-pull tabs, however, as they removed the whole top of the can. With my weissbier glasses still packed away in the basement, I ended up drinking from a plain mug. Schnickelfritz was certainly traditional in appearance. It was a lovely light yellow and hazy. Sadly, the head was small and disappeared with some haste. There was a fair number of bubbles inside. My preference in weissbiers is for more of an emphasis on those estery banana scents and flavors with phenolic clove and bubble gum taking supporting roles. Schnickelfritz did not disappoint as banana took pride of place on the nose with clove lurking in the background. I also caught the wonderful, toasty, smell of wheat. Not even having tasted it, the bier had me pining for warmer, sunnier days. As with the aroma, the taste was full of that banana goodness with just a touch of clove and a hint of bubble gum. It had an eminently quaffable light body with a sizable wheatiness. There was a little acidic bite to it and a firm fizzyness. The banana and wheat stuck around at the finish while that acidulous tang was heightened taking on a prominent lemony tartness. There was no Schaumhaftvermoegen to be had. 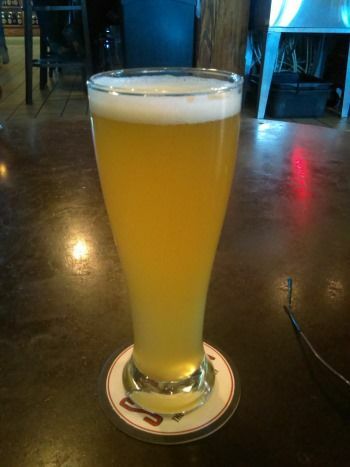 Schnickelfritz is a fine weissbier. But I'd expect nothing less than a bier from a Reverence series formulated by a brewmaster who trained in Germany. If Urban Chestnut distributed here in Madison this would definitely be in my refrigerator summer long. Light-bodied and a modest 4.8% A.B.V., it was still flavorful with plenty of my preferred banana taste while clove and bubble gum took back seats. A perfect balance, to my palate. Plus it was nice'n'fizzy. Simply wonderful. Junk food pairing: In keeping with the reverence theme, pair Schnickelfritz with soft pretzels and plenty of warm cheese food product dip. On the whole I liked St. Louis. But there was one scene which summed up the city for me. As we were driving west over to The Cellar, I spied a new or newly remodeled apartment building. Lovely red brick dotted with black iron balconies. Next to it was a vacant lot overgrown with weeds and ringed by a fence topped with barbed wire. That juxtaposition really encapsulated the city for me. Signs of life and prosperity sitting uneasily next to abandonment and decay. (It was easy to see where all the melancholy in Jay Farrar's songs comes from.) At its peak in the 1950s St. Louis was home to 850,000 people while the most recent census estimate places that figure at just over 312,000. So vacant lots and boarded up buildings are to be expected. As a public transit advocate I looked for buses but didn't see many. Before I knew where we were going to be staying I gave the Metro Transit site a perusal in case I had time to wander on my own. Bus service was a lot like Madison's in that headway dropped to 30-40 minutes, generally, outside of rush hour. I did see one of the MetroLink trains over in East St. Louis heading across the river. (Parts of East St. Louis seen from the interstate look almost like war zones with abandoned and burned out buildings.) But we didn't spend much time near the train's route. The lack of public transit and the near absence of bicyclists and pedestrians that I mentioned in a previous post meant that St. Louis lacked that vital pulse that makes cities what they are. Most folks got in their cars, drove, parked, and went inside, it seemed. A week before going to St. Louis I was in Chicago to see "Hamilton" and the contrast between the downtowns is remarkable. Comparing St. Louis and Chicago comes with a lot of caveats – size, population, and so on. Still, St. Louis' downtown was indeed eerily quiet. It just didn't seem to have a great density of shops and whatnot to keep drawing people. 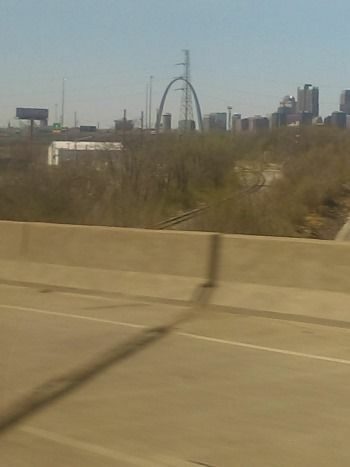 I mean, if you're a St. Louisan, how many times can you go see the Arch? I don't recall seeing any theatres and the City Museum is west of the CBD. I'll note that we only covered a limited area. 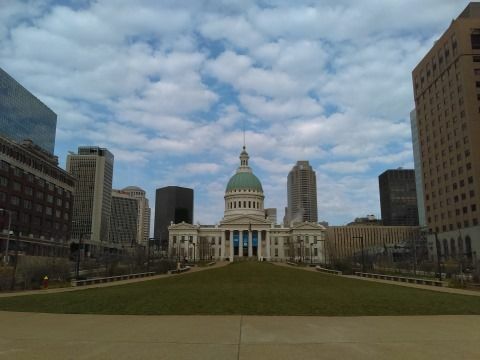 However, it appears that most of the touristy attractions in St. Louis are outside of downtown and really rather dispersed around the city. I've already written two posts about the St. Louis beer scene so I won't say too much here besides that I was mightily impressed. A good variety of new and old. Sour beers, English milds, German lagers, eyepahs heavy on fruity American hops – it was all there. And that $2.50 half pints at Civil Life were a real treat. The food was great. Plenty of pork. Smoked salmon was rather common which surprised me. Next time I'm down there I must try out the unique culinary treats on offer though I reserve the right to be patently offended by Provel. I consider St. Louis to be part of the South though everyone I ran into spoke with a Midwestern accent. People were also uniformly friendly. So that's my take on St. Louis. There was a palpable sense of decline though there certainly were bright spots. Not only was there was great contrast to The Loop but even to Madison. Despite all of its problems, its small townness, and envy of larger cities, Madison is a city on the make and growing. Two very different vibes. I have only scratched the surface of St. Louis, though. The city may only be 312,000 people but the metro area, depending on your definition, is somewhere between 2.2-2.8 million. Not insignificant. There's still much of the area to see and experience. Sunday was the day for doing the tourist thing. I arose and ate the Long John I bought at Strange Doughnuts which was quite tasty. 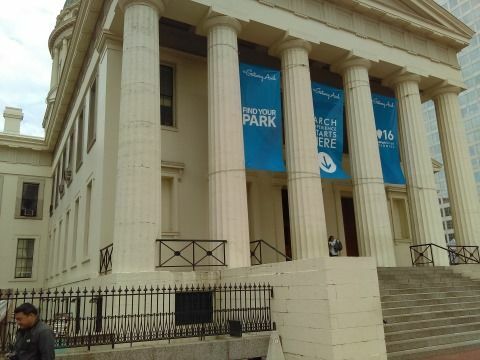 We headed downtown with our first destination being the Old Courthouse. It had a really hoopy dome. 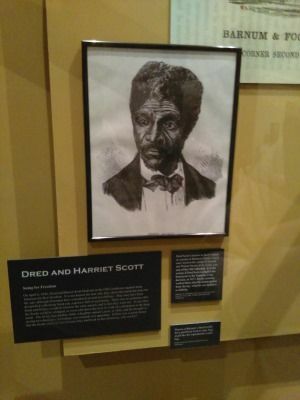 That would be Dred and Harriet Scott who filed separate lawsuits in their collective bid for freedom and to simply be treated as people as opposed to mere human chattel. 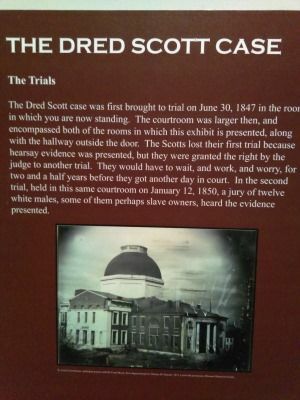 It was rather humbling and awe-inspiring to be in the very room that the Scotts were as they began their legal quest. 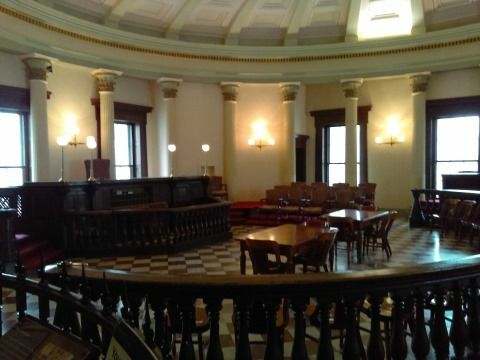 In addition to that hallowed room, there were a couple other courtrooms preserved in their 19th century glory such as this one. 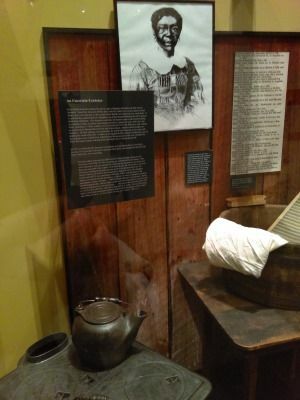 Aside from legal history, the museum also had exhibits depicting the history of St. Louis and its role as the Gateway to the West. The area is rich in Native American history with the site of the Mississippian metropolis, Cahokia, right across the river. Then came explorers, trappers, and traders. I have to say that the depiction of a couple trappers hunched over a fire in a small shelter during the winter made me quite thankful for modern amenities. The city was the terminal stop for aspiring pioneers who would take on food, wagons, supplies, and whatever else they required before heeding Horace Greeley's plea. And so one exhibit had a wagon and all the kit used by those seeking their fortune out west. Again, I was thankful for being a denizen of the 21st century. 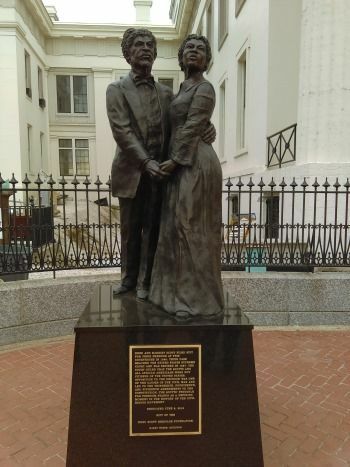 Outside was a statue of the Scotts. And across the street was The Arch. Unfortunately it was undergoing renovations both to the museum underneath and to area around the base so we couldn't get particularly close. It was truly a spectacle to behold and warrants a return trip to take the tram ride up to the top. There was a tram in the Courthouse and either the Arch's design didn't warrant anything larger or people were considerably smaller back in the 1960s. Since Madison does a poor job of opening its lakefronts to the public, I was curious as to what St. Louis did with its riverfront but the construction prevented me from checking that out. 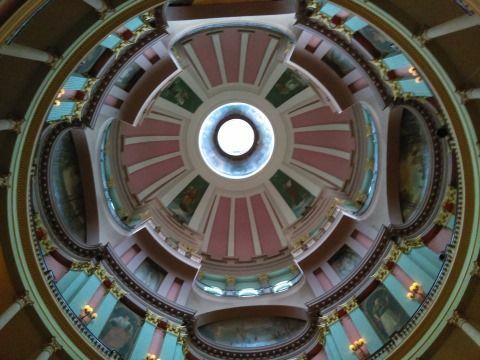 Here's the Courthouse looking west from the Arch. St. Louis' downtown is setup rather neatly. West of the Arch is the Old Courthouse. Extending five or six blocks behind it are a series of parks each taking up a block. Some really nice greenspaces with modern sculpture aplenty including a couple rabbits and a heading lying on its side. At 11th Street where the parks end there are a couple courthouses done up in Greek Revival featuring wonderful colonnades. Downtown was really nice with some gorgeous buildings. Many of them are fairly tall but the wide streets and open spaces kept away that canyon feel like you get in Chicago. I wish we'd had more time because it was eminently walkable and I'd have loved to have wander around. The sad part was that there were very few people around – at least for what I'd think a downtown would have. A few families dotted the parks while the Arch and Courthouse hosted a fair number of tourists including a school group or perhaps Girl Scout troop. Granted, it was a Sunday morning but I still thought there'd be more folks milling about. This is apparently par for the course. I found an article about the decline of St. Loius which notes "Downtown St. Louis sits eerily quiet on most days, despite millions of taxpayer dollars spent on upgrades." I should give the caveat that we did not look around all of downtown. But the parts we did seemed to lack draws. 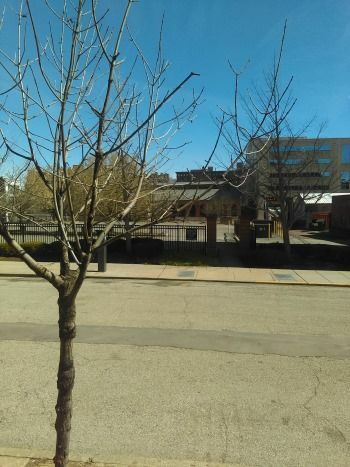 While I'm sure downtown is overflowing with humanity when there's a baseball or football game – both stadiums are near the riverfront – but I didn't see many stores or other attractions to keep people coming. Soon enough it was time to head out for some barbecue. 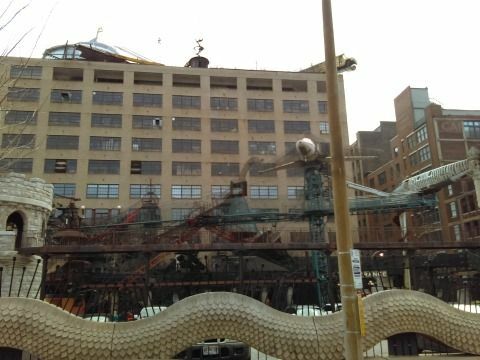 On our way we drove by the City Museum with its funky outdoor playground. The ostensible purpose of the trip was to indulge in smoked meat at Pappy's Smokehouse in Midtown which is a little west of downtown. We arrived around opening time and the line was almost, but not quite, out the door. I had discovered the reason that downtown was so bereft of people. As we neared the counter, I noticed a couple of St. Louis' finest making their way out having had an early lunch. The place was hoppin'. We placed our orders and found a table. My friend Charles swears that Pappy's has the best ribs in all of Christendom so I got a half slab along with a chicken quarter. (Plus some pulled pork and brisket to take home.) Also on tap were Fitz's sodas, St. Louis' own. I did not try them, alas. 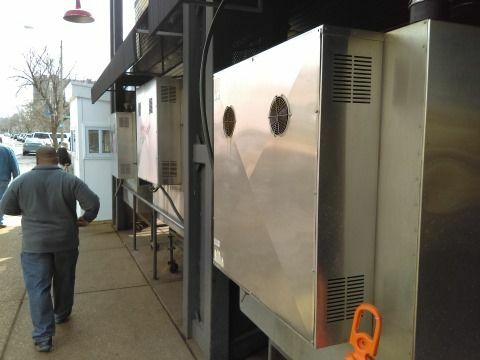 Here are the smokers taking a rest out on the sidewalk. There mere sight of this is Madison would send neighborhood association presidents into immediate cardiac arrest. With lunch done, we packed our coolers and hit the road home. Our hotel was way out west, next to an I270 off ramp. I don't think it was actually in the city of St. Louis proper. Before making the trek out there for check-in, we decided to stop for one more beer. 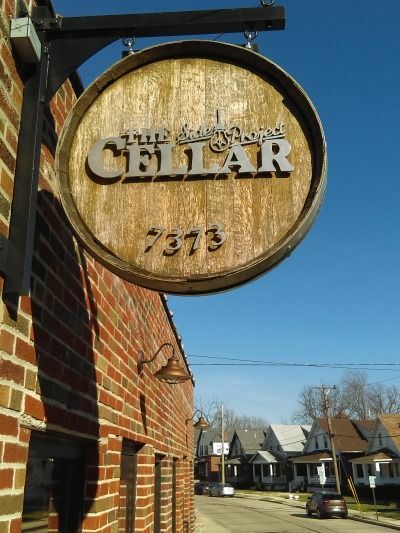 This time it would be Side Project Brewing's The Cellar out in Maplewood. Stepping out of our vehicle we saw this in one direction. 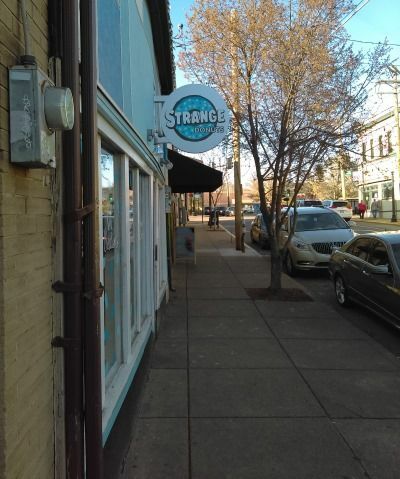 We had to stop in at Strange Donuts. Each of us bought a pastry for breakfast the following morning. (They were tasty.) 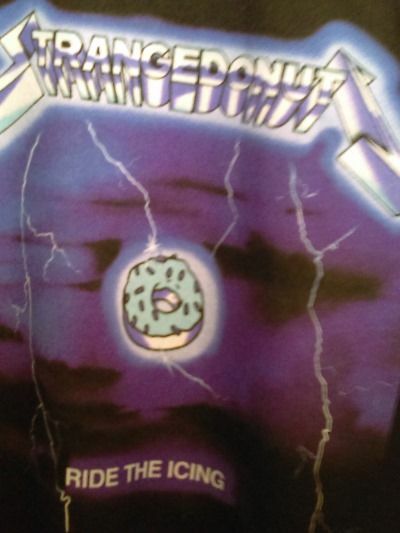 There were also t-shirts on offer such as this hoopy one. Donuts safely stowed in the car, it was off to The Cellar. Friend: What did you get? 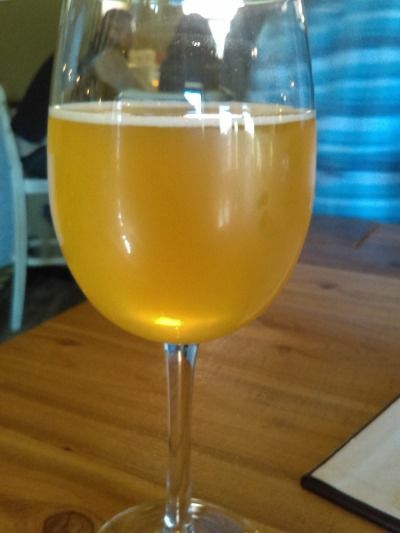 Me (looking at menu): A brett-fermented farmhouse ale aged in oak. I'd heard of the grisette but had no idea what it was. And nobody else really knows either as descriptions of it prior to its recent revival here in the States have apparently all been lost. There is general agreement that it was a low-alcohol brew made for miners in the Hainaut region of Belgium at some point in the dim and distant past. Having had some, I can imagine those miners quaffing this stuff by the gallon. It was light, slightly funky-tart, a little oaky, and just all-around tasty. However, the irony of me drinking a less than 12oz pour of a beer originally made for working stiffs costing about as much as the minimum wage in this country was not lost on me. 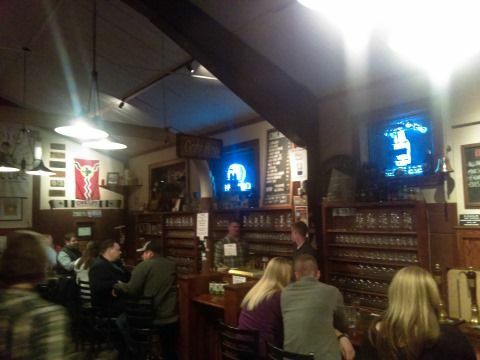 The Cellar was definitely a place for craft beer aficionados and fairly well-heeled ones at that. Look at the menu. Notice the serving temperatures listed as well as the level of toasting of the foedre used for aging the Foedre Fermier. Not quite the place for hoi polloi like myself. Still, I really enjoyed my grisette as well as the rye my friend James ordered. There were two ice cubes in the glass and they were nearly flawless. You'd need some kind of laser to detect the imperfections. The room itself was bright and had some nice rustic charm to it. The Cellar was also the second place in a row whose men's room had but one single solitary toilet. We made it to the hotel, which was located in a light industrial area, only to find that not enough rooms had been booked and that most of those that were were not yet ready. A real charley foxtrot but also not really that big of a deal. The food, drink, and company more than made up for it. Once things were sorted, we hit the road back into the city for dinner at Iron Barley Eating Establishment. We had a short wait for a table and so we settled at the bar. I ordered a Zwickel from Urban Chestnut although I was impressed that there was a beer engine back there and it foreshadowed our last stop of the night. Someone else who was waiting struck up a conversation with my friend Randy. 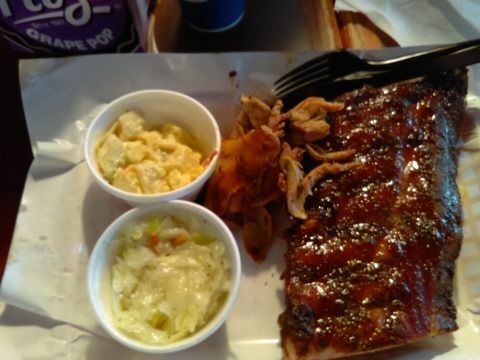 He told the gentleman that we were from out of town and looking forward to hitting Pappy's Smokehouse the next day. Randy's interlocutor remarked that there was a new barbecue place in town, a pretender to Pappy's throne, and that their smoked salmon was fantastic. For dinner I had about an entire pig's worth of ribs perched atop a bed of braised sauerkraut. Quite tasty. I noticed that the menu also offered smoked salmon. A pattern was developing here. Smoked salmon was seemingly quite common. I sampled some toasted barley and it too was delicious. The place reminded me of The Weary Traveler here in Madison though the tavern side of things was smaller. And it was more ragged but not in a forced or kitschy way. I will add that the waitress was wonderful and managed to rattle off a list of what seemed like a dozen specials with ease. Very impressive. The water closet had but one commode. 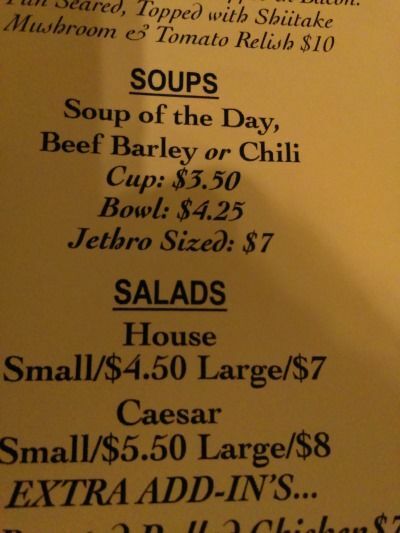 I don't know how much a "Jethro sized" vessel holds, but you could get one of soup. The neighborhood that Iron Barley is located in was...distressed? It wasn't bad in the sense of there being drug dealers and prostitutes on every corner but there were a lot of vacant buildings in the area. The street was lined with these two-story apartments and just about every other one was boarded up. I didn't see any broken windows nor graffiti, though. For a nightcap it was off to Civil Life Brewing. It was tucked away off of an arterial street and had a nice old-time tavern look about it. My comrade Charles was especially keen on Civil Life as they specialize in beers of the British Isles. He had lived in England for a spell where he acquired a taste for milds and ESBs and has a hard time finding versions of these beers here in the States that match the taste of those he had in their homeland. According to him Civil Life gets as close as you can this side of the Atlantic. Full English pints were available but also half pints for $2.50. It was a steal especially considering how tasty the beer was. I had a British Bitter. Cracker and caramel on the malt side with herbal, almost medicinal, hoppiness. Simply tasty. 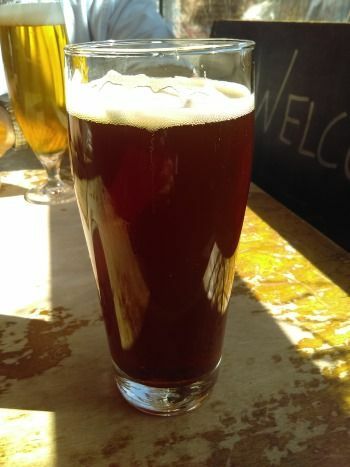 I sampled Charles' ESB and it to was great. And, yes, the restroom had but a lone toilet. St. Louis regulations must stipulate 1 toilet per 300 people because Civil Life is not small. There's the main bar area with a dart area in back and more room upstairs. Plus there's seating outside to boot. There must be long lines during the summer. Civil Life closed at 11:00 and we were on the road back to the hotel by then. A few weekends ago a few friends and I engaged in the great American tradition of jumping in a car and hitting the road. Our destination: the Gateway City. While I'd driven through it previously I had never actually spent any time outside of my car there. My cohorts all agreed that Pappy's Smokehouse had some of the best barbecue in all of Christendom with their ribs being singularly tasty. A weekend of beer, barbecue, and good company was just the way to help usher in spring. We had reserved a minivan but ended up with a giant black Suburban featuring tinted back windows. It was luxurious. The middle bench where I sat had its own climate control with vents on the ceiling a la airplanes. There were a couple displays and a Bluray player too. In addition to temperature and fan controls, the rear panel also had a USB jack and, oddly enough, RCA jacks. Apparently there are portable home electronics that don't use HDMI. As Chicagoland faded into central Illinois I noticed the exit for the town from which one of my grandmothers hailed. Actually she grew up on a farm and I'd bet the landscape hasn't changed all that much in the 100 or so years since she had lived there. Flat with fields seemingly everywhere. I could completely understand why in 1933 at the tender age of 18 she ventured to see the World's Fair in Chicago and decided not to return home. Electricity, indoor plumbing, and head-first humanity – all 3.3 million of them. 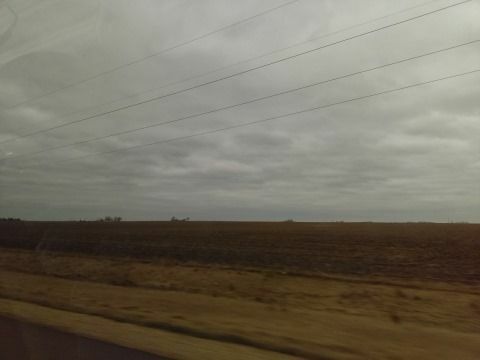 The flatlands of Illinois finally gave way and soon the Arch could be seen in the distance. Having seen it before I suppose it wasn't quite the thrill that it could have been. Still, this was St. Louis. On the Mighty Missisipp. Land of Mark Twain. And Son Volt. (Who had a gig that night in town.) Honestly, I had "Afterglow 61" in my head the whole weekend. Attempts to locate the highway failed, however. St. Louis was very much a city on the make back in the 19th century. Being on the shores of the Mississippi River gave it a significant edge in transportation. But it never became the industrial powerhouse of the central part of the country because Chicago became the nation's rail hub. Still, St. Louis was no slouch and it was eventually home to plenty of industry and some 850,000 people at its peak in the 1950s. And then industry left followed by people leaving St. Louis at some 315,000 inhabitants today. That about exhausts my knowledge of St. Louis history I had going in. 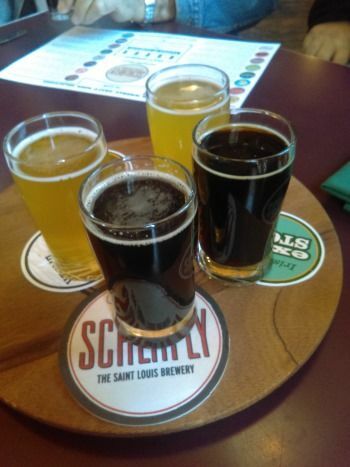 Our first destination was The Schlafly Tap Room for lunch and our first sampling of St. Louis microbrews. The Tap Room is just west of downtown nestled amongst some beautiful old buildings. Sadly, there were some that were empty and boarded up. This would emerge as a leitmotif as I wandered the city. But after 60%+ of your population decamps, it is no surprise that there would be abandoned buildings. I suppose I just didn't expect them to be so close to downtown. The Schlafly Tap Room was fairly busy when we got there and became only more so as two or three large groups of young women came in shortly after we did. I figured that these were gals out celebrating a birthday. "Tap Room" is something of a misnomer because The Tap Room was really more of a gastropub. The eatery portion of the joint was co-equal to, if not more prominent, than the drinking one as the bar was on the small side. While certainly pleasant and sunny, the décor was on the prosaic side. It was a mix of patrons although the hipster craft beer aficionados were greatly outnumbered by non-hipsters including families with children. It was a beautiful sunny day and rather warm so I ordered the Hefeweizen which was perfect. A big blast of wheat followed by a generous helping of banana accented by a hint of clove. It also had a nice lemony tang to it. We were eventually seated for lunch. The menu was what I think of as being typical for brewpubs these days. You've got your standard American dishes done upscale like meatloaf, hamburgers (served on an English muffin), and so on accompanied by things such as curry, falafel, schnitzel, Shepherd's Pie, et al. A real hodgepodge of culinary traditions with no emphasis. For my part, I had a catfish po' boy which was tasty although it seemed well-dressed. Tangent: I think the only po' po' boy I have ever eaten was in Breaux Bridge, Louisiana at their crawfish festival. I stepped up to the table run by something like the Breaux Bridge Women's Auxiliary and a kindly old lady provided me with a shrimp po' boy. (I would go on to eat a lot of crawfish. So much so, in fact, that I had hives by the time we hit the road home.) No vegetables here. French bread, mayo, and enough shrimp to feed an army. I don't know how she stuffed all of them in there. Anyway, my po' boy was tasty and my friends enjoyed their burger, Shepherd's pie, and mussels (flown in from the Pacific Northwest). The schnitzel was less warmly greeted as it seemed a bit over-cooked with the theory being that it was not pan fried but instead deep fried. My friend Randy got a flight of beer that we shared with our meal. And so we tried the Hefeweizen, Kölsch, Irish Extra Stout, Cask Coffee Stout, and Cask Chocolate Stout. There was just too much coffee for Randy in the stout so I had it all to myself and found it delicious, although I do concur that it was heavy on the joe. The chocolate stout was tasty and featured a lighter touch on the chocolate than its sister brew did with the coffee. I'll go for the trifecta and say that the Irish Extra Stout was also very tasty. Lots of good, unabetted coffee and chocolate notes. 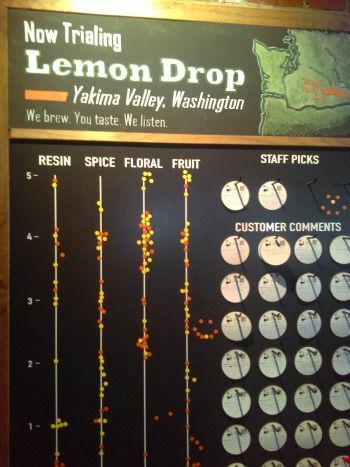 On one wall was the big hop board noting that Lemon Drop was the hop of the moment although I don't recall which brews they were featured in. Presumably a pale ale of some sort. The streets were deserted. Well, I did see one bicyclist but overall it felt like I was in a scene from The Day After and I just dated myself terribly. There were no pedestrians. Inside was all convivial and Gemuchlikeit but outside was almost a ghost town. The pavements were not teeming with intense energy, to borrow a line from Neil Peart. After lunch we headed west (where else?) 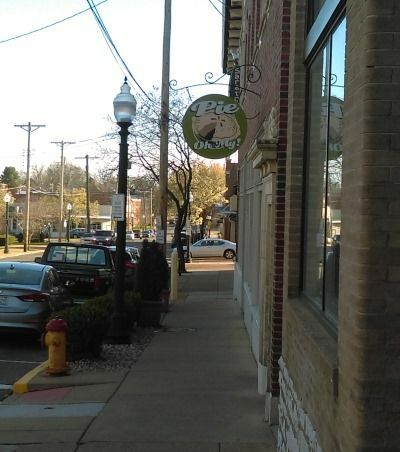 to Urban Chestnut's Midtown Brewery & Biergarten. On the way there I noticed the odd parking stalls of St. Louis. They are at an angle but the lines point in the direction of traffic instead of against it. St. Louisans must stop and back into them. I also noticed several gorgeous old churches along the way. 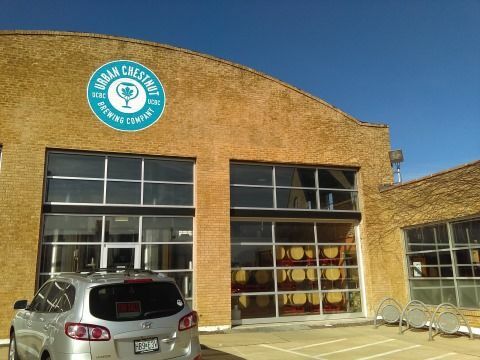 Urban Chestnut appeared to have been built into a disused auto garage with the brewery in the former bays. The area for us customers was in a rectangular room with wooden benches and featured spartan drinking hall décor. Brewmaster Florian Kuplent learned his trade in Germany and so UCBC's line-up is a blend of traditional German styles and more contemporary American ones. I had a dunkel and it was good. 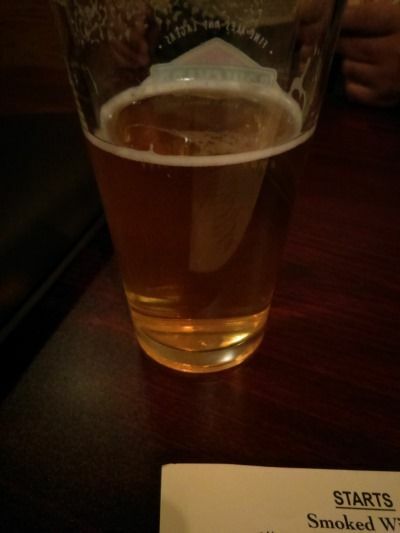 Randy ordered Urban King, an extra cream lager, which I sampled and enjoyed even more. Oats made it smooth and I really loved the big, green, grassy hops. UCBC was bright and airy. They served food and the menu included Landjäger, curry wurst, and smoked salmon salad. Keep this latter one in mind for my next post. There were several young families enjoying themselves as we drank as played Connect 4. 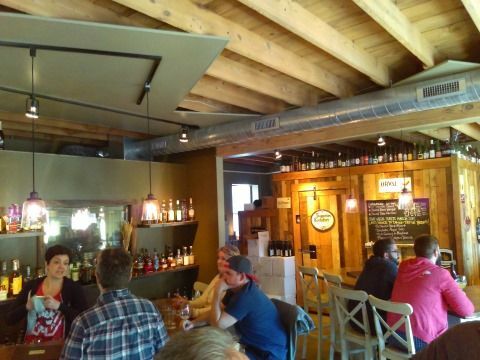 If Schlafly was akin to a Rock Bottom, then UCBC had the vibe of Sugar Maple in Milwaukee. It was less of a restaurant and more of a neighborhood joint. Having said that, both places brew excellent beer and they both offer a nice mix of lagers and ales, traditional styles and newer ones. UCBC and Schlafly appear to be the larger breweries of the St. Louis craft beer scene. To finish the day we would visit a couple of the smaller ones. 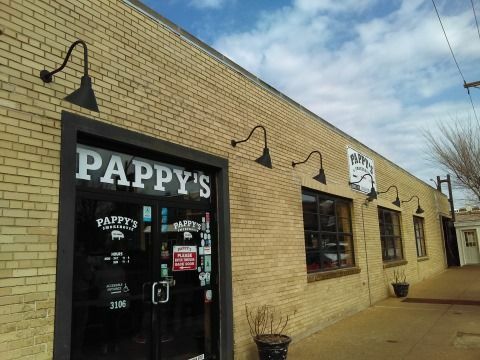 A friend of mine who swears that Pappy's Smokehouse in St. Louis has the best ribs and pulled pork in the known universe had been talking about making a trek south to enjoy some of their admittedly very fine ribs and whatever other meat trips his trigger that day. Well, that day happened a few weeks ago. 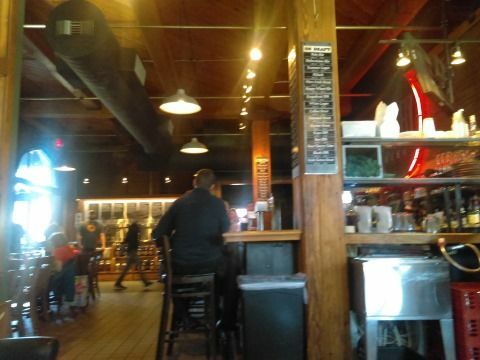 As I discovered less than a mile from Pappy's lies The Schlafly Tap Room. And it was our first stop after we rolled into town. My experience with the brewery's beer is not extensive which is probably due to a combination of my parochial tastes and the limited selection of their brews I am presented with at the bottle shops I frequent in Chicagoland. Amongst the brews I sampled was their hefeweizen which was excellent. It featured fine phenolic banana with a touch of estery clove – just the way I like it. A light body and a citrusy edge made it perfect for a nice sunny day. Upon returning home I was reminded that I had started a review of their Noble Lager but had never finished it. And so I thought it was the right time to do so. Noble Lager is a late summer seasonal and I found some in Chicago last autumn. 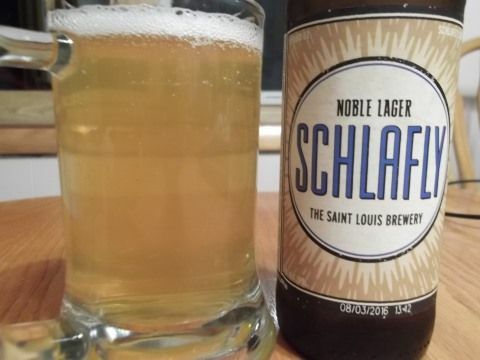 Schlafly bills it as a "traditional lager" without saying whose traditions in which it was steeped. The ingredients are all European or European varieties but it's not being sold as a Helles. An American lager with European ingredients, perhaps? 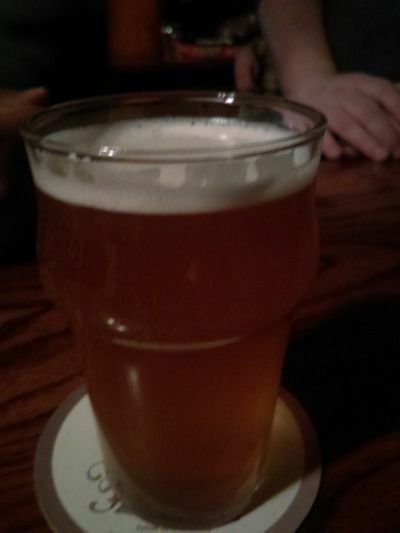 The beer was a medium yellow hue and, curiously enough, hazy. Not muddled like the new trend in eyepahs – just a tad cloudy. (May St. Gambrinus save us from totally turbid lagers!) I managed only a small head on my pour which was loose and white and lasted about an average time while inside was a surfeit of bubbles. While clarity would have perhaps made for a prettier beer, it still looked good to me. If the label "traditional lager" had me worried that this was going to be what I see called an "American pale lager" – often times a moniker for micros that are macro+ - then my fears were dispelled quickly because Noble Lager tasted like a Zwickel/Kellerbier. The heavenly trifecta of biscuit, bread, and yeast were like manna to my tongue. A bit of honeyed sweetness followed before those Noble hops imparted a nice grassiness. Just enough to add balance along with a firm fizziness. The finish was a bit surprising. As the malt faded a bold spicy hop taste took over. Think black pepper. This made things fairly dry and bitter and gave a nice crisp snap to the finale. My glass had Schaumhaftvermoegen everywhere and thick webs of it too. It was a beauty, eh. Whatever a "traditional lager" is, count me in because this is a fantastic beer. It was as if a melanoidin bomb went off in the kettle triggering countless Maillard reactions to give Noble Lager its great toasty-bready aroma and flavor. And the yeast was a bonus. I wish some of that floral scent has been in the taste but that's a minor quibble. The Saaz-like finish was a lovely surprise and added a nice contrast to the clean bready flavor. I'd love a return trip to Schlafly to taste this stuff fresh from the teat. Junk food pairing: Pair Noble Lager with a heaping plate of potato chips topped with melted Provel.